These are two March 1939 posters from Vienna. Nazi Gauleiter Bürckel had ordained price reductions on many items in a speech shortly before that accused Jews of commercial misdeeds. 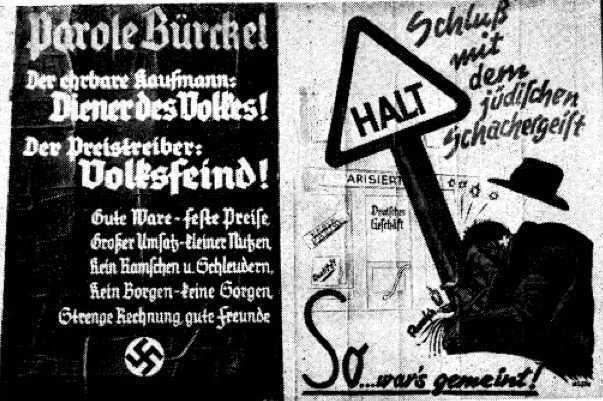 The first poster states: “Bürckel Says: The honest merchant is a servant of the people! He who charges excessive prices is an enemy of the people! Good products — fixed prices. Higher sales — Less exploitation. No hoarding or dumping prices. No borrowing — No worries. Clear bills — Good friends.” The second has a direct anti-Semitic theme: “Down with the Jewish bargaining spirit!” These were printed in Das Kleine Blatt, a Vienna newspaper.